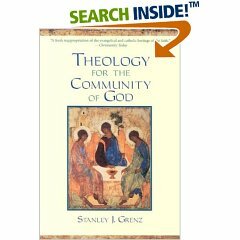 Yesterday I finally finished Theology for the Community of God by Stanley J. Grenz. Most of the time I don’t get this excited about finishing a book but this one was a dense 659 pages. I highly recommend it for anyone who is interested in theology at any level. It’s highly informative, moderately easy to read, and very well written. It’s got a section on just about everything and I will certainly be using it as a source from here on out.